Hi all! I think Spring has finally decided to come for a visit in the Midwest! I’m hoping it’s an extended visit. 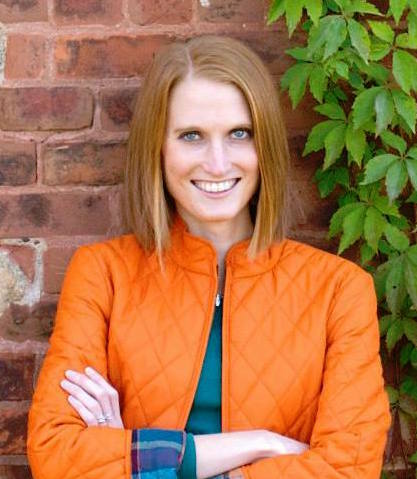 Even if it isn’t, I’ve been breaking out my spring jackets, bright clothes, and (gasp!) going sock-less, nonetheless! This is saying a lot, since my feet are always cold. For me to make this sacrifice means I’m ready for spring already! This past weekend put me even more in the mood for spring when I walked into our local garden center, Jung’s. Just the earthy smell common in all garden centers made me hopeful for more of this warmer weather. I’ve never been able to have a garden since I’ve always lived in apartments since college, but eventually I wanted to give one a try. Last summer I heard Madison has community gardens scattered throughout the city; I knew that this year I was going to get onboard and see if I have even a marginally green thumb. For just a small fee, I was able to claim half a plot (10′ x 20′) close to our apartment along with all the tools and things I need to get started. Talk about perfect! 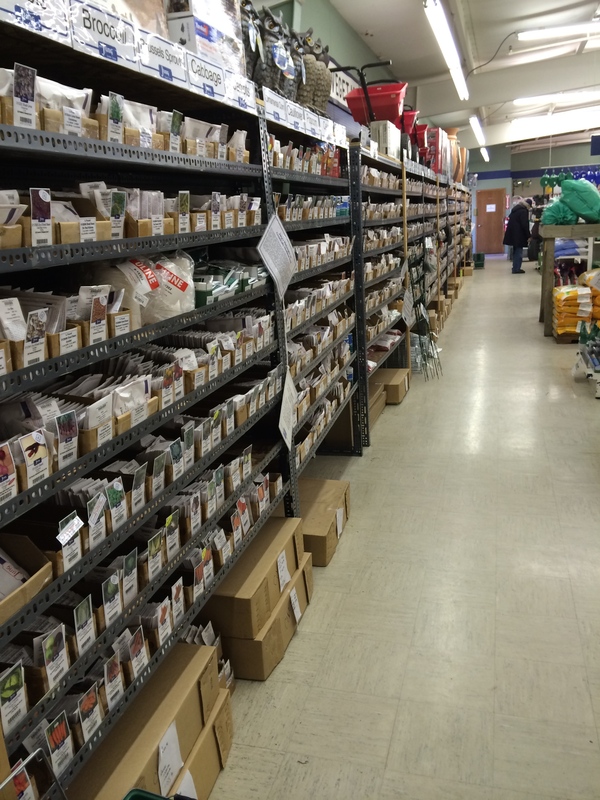 Jung’s had quite the selection of seeds, not to mention excellent service for a novice like me. I had made up a “wish list” of sorts of what I wanted to plant beforehand and Philip and I randomly went through and picked the varieties we wanted. 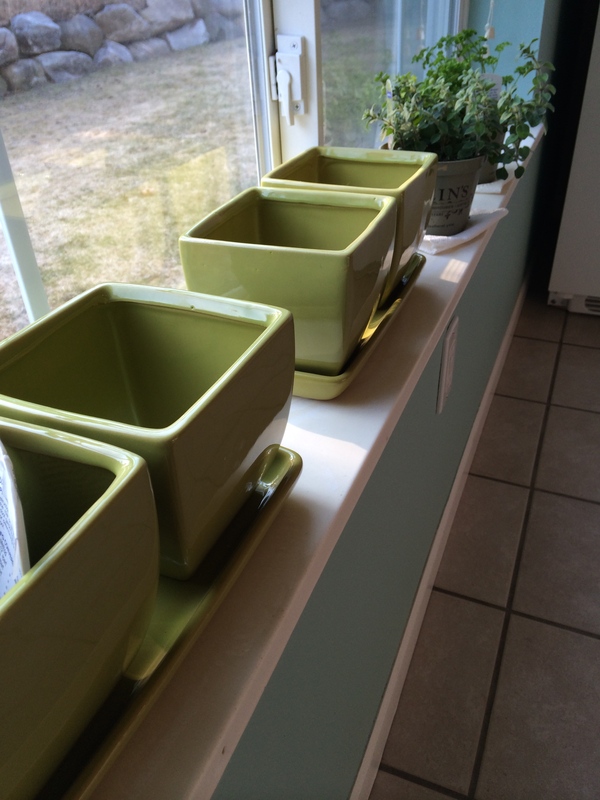 I’ll keep you posted on how things go in my garden this summer! With the thought of fresh produce and warm days on my mind, I knew a colorful salad with a twist was perfect for a simple, yet filling meal. That’s where my Asian Chicken Salad comes in. It is out of this world! Seriously. 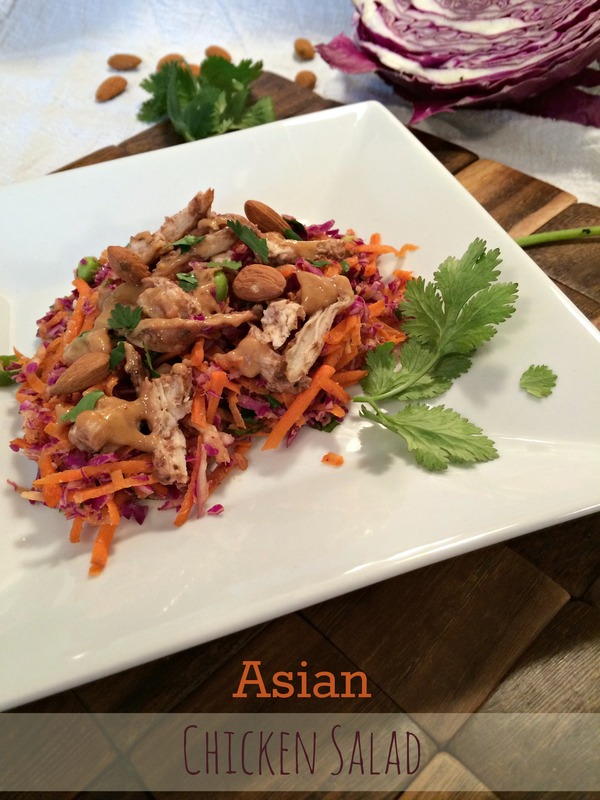 There are so many different flavors coming together with the marinated chicken, the peanut sauce dressing, and the salad itself that all play together perfectly. Philip, who is learning about describing our meals for me, noted the salad as being fresh while still having a degree of depth to it (he makes me so proud). He’s so right, too. The chicken is marinated in a mixture of soy sauce, garlic, ginger, sugar, and 5-Spice Seasoning before being baked and shredded. All of these flavors combine to make the most flavorful and moist chicken. Like I mentioned for my Kung Pao Chicken, the 5-Spice Seasoning just adds so much extra “oomph” to Asian dishes. It cannot be replicated. This is one spice I recommend you go out and buy. I promise it won’t just be another spice that sits in the back of your cabinet. I use it again and again for my Asian-inspired dishes. 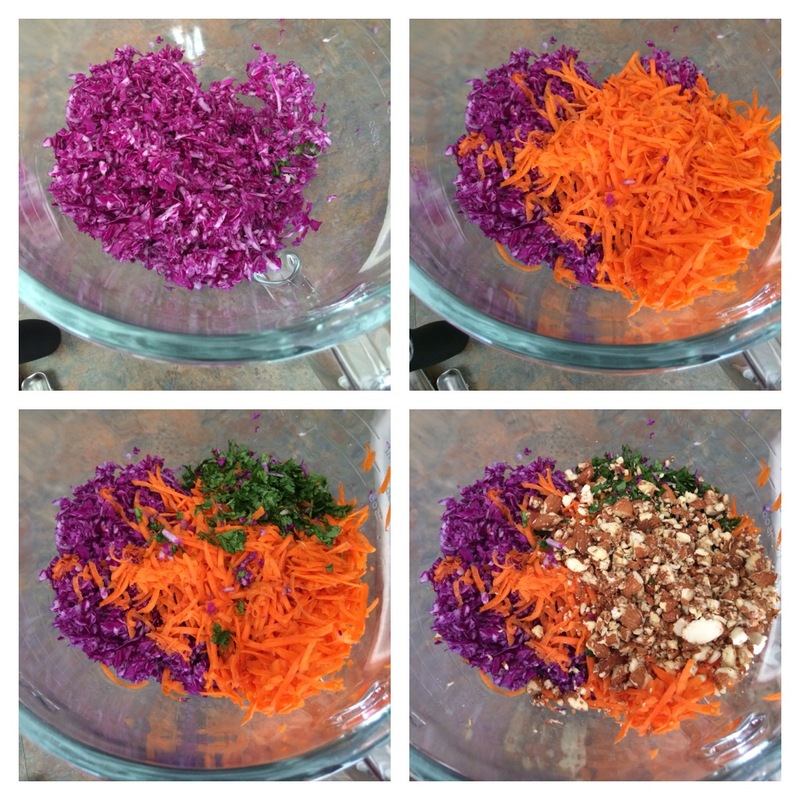 The next step is making the most colorful salad with shredded red cabbage, chopped green onions, shredded carrots, chopped cilantro, edamame, and sliced almonds. Seeing my bowl gradually get more and more colorful made me so happy. Is that normal? Even if it’s not, I loved seeing it come together before my eyes. 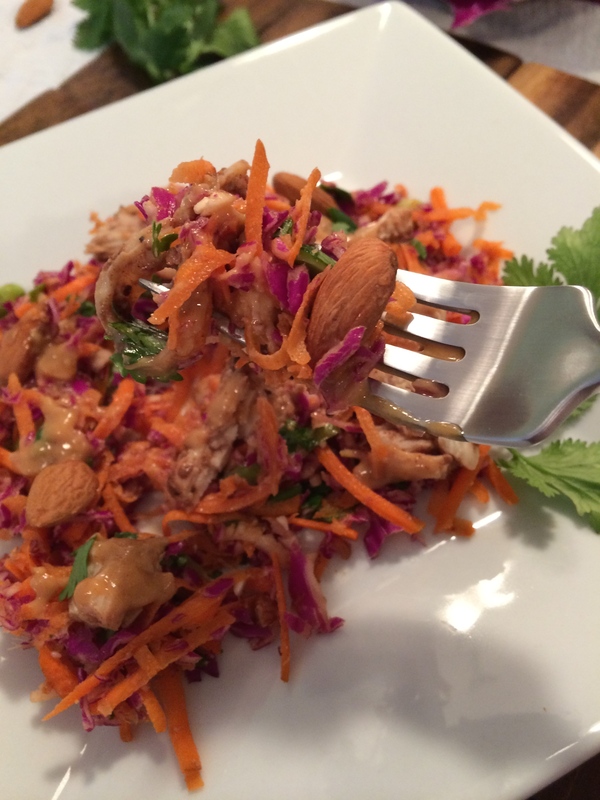 Last but not least, the peanut salad dressing adds the final “depth of flavor” to the salad. It really ties everything together. Not to mention, it comes together in no time. Combine all the ingredients into a food processor (or into a bowl) and blend (or whisk). 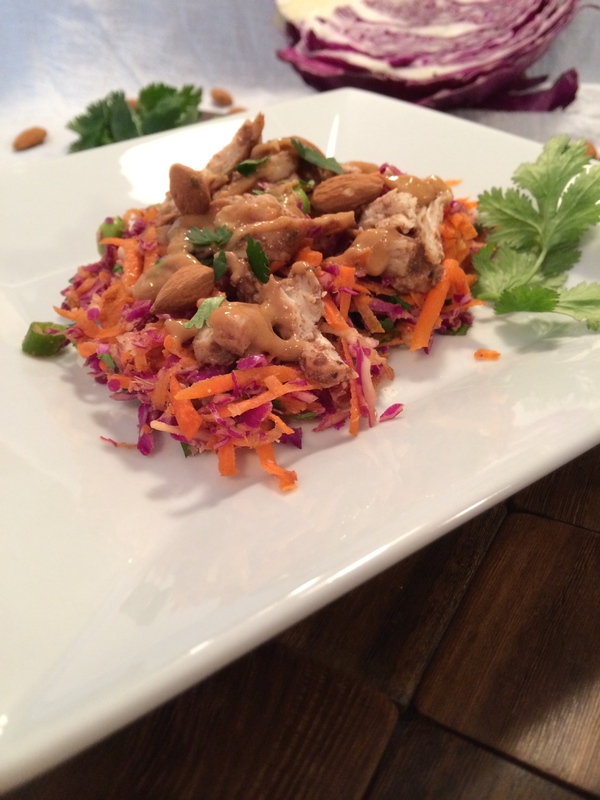 The dressing drizzles onto the salad thickly due to the peanut butter and hoisin sauce. 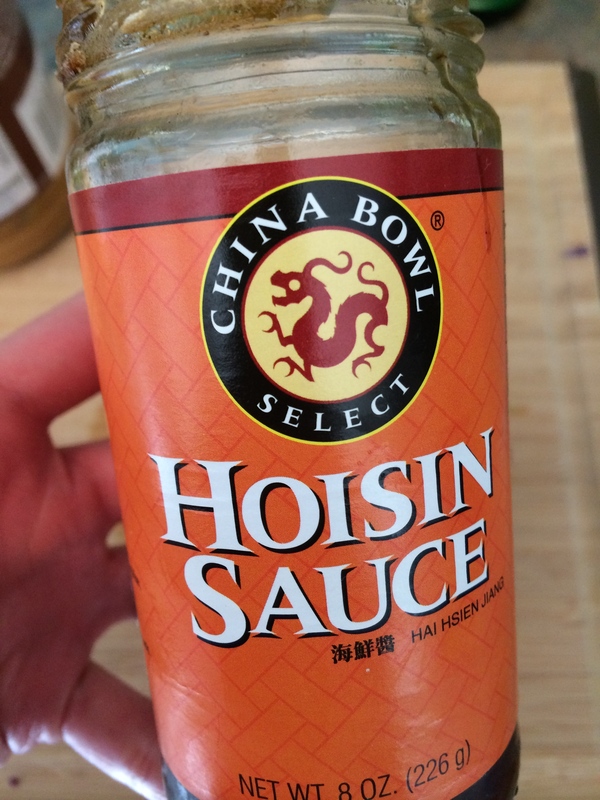 Hoisin sauce is a common ingredient in Asian cuisine and is their equivalent to our barbecue sauce. It’s thick like syrup and is slightly sweet, but also a little salty. By no means would I phrase it as “healthy,” but it definitely adds that little bit of flavor that can’t be duplicated. What I love about this salad is that it can all be made in pieces ahead of time. I prepared the chicken, salad, and dressing the day before serving and stored each piece separately. It made it so easy to come home from work, combine everything together faster than I could heat up leftovers, and dinner was served. Feel free to leave the peanut dressing off the salad and let everybody add as much or as little as they like. This makes the actual leftovers much better, as the dressing would otherwise make the salad soggy and heavy. Nobody likes a soggy salad. Whisk the soy sauce, water, garlic, ginger, sugar, and 5-spice seasoning together in a small bowl. If using large chicken breasts, cut the chicken in half lengthwise in order to reduce baking time. 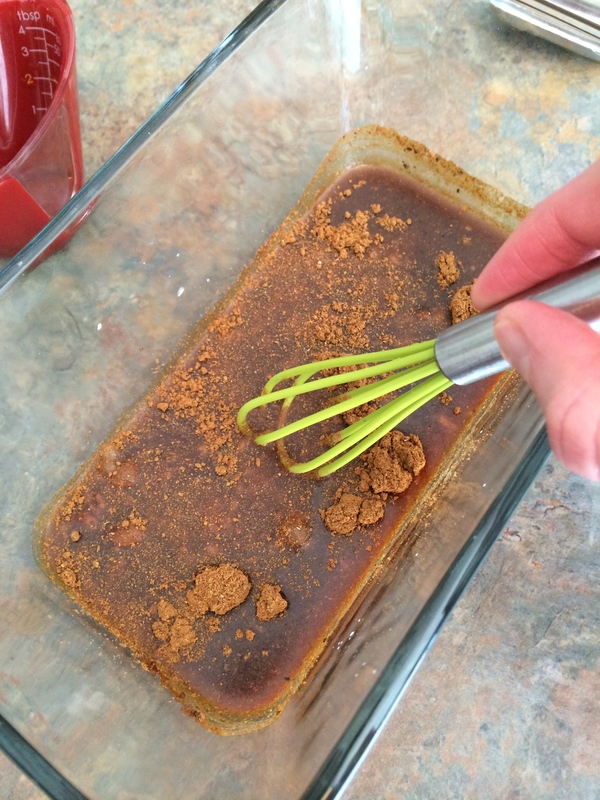 Add the chicken to the marinade and marinate for at least 15 minutes (no more than 1 hour). Bake the chicken in the sauce in a glass baking dish at 400° F for about 15 minutes until cooked through. When chicken is cool, shred and set aside. 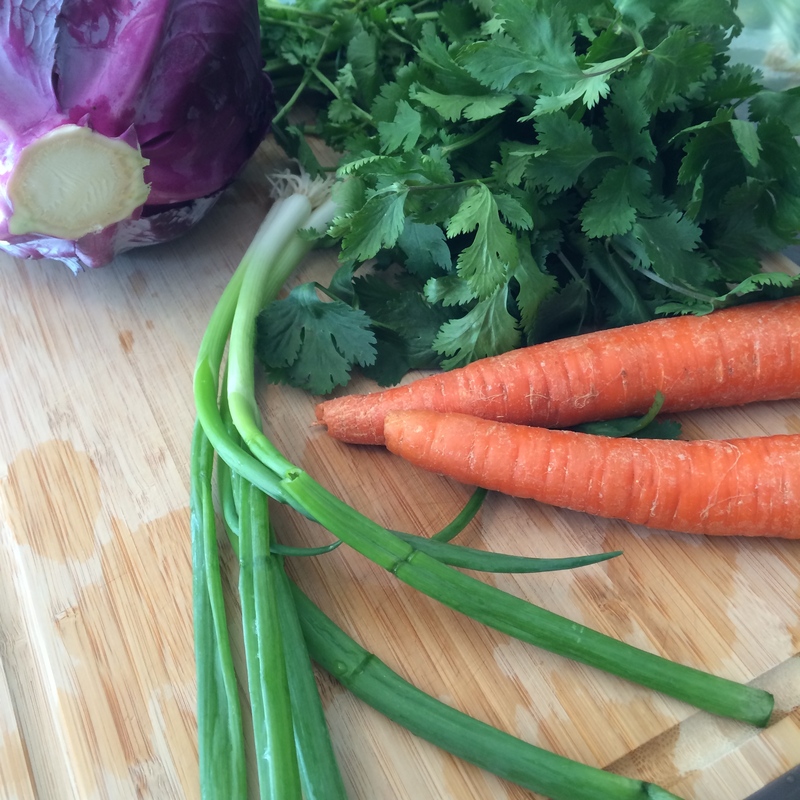 Toss the green onions, cabbage, carrots, cilantro, almonds, and edamame together in a large bowl. 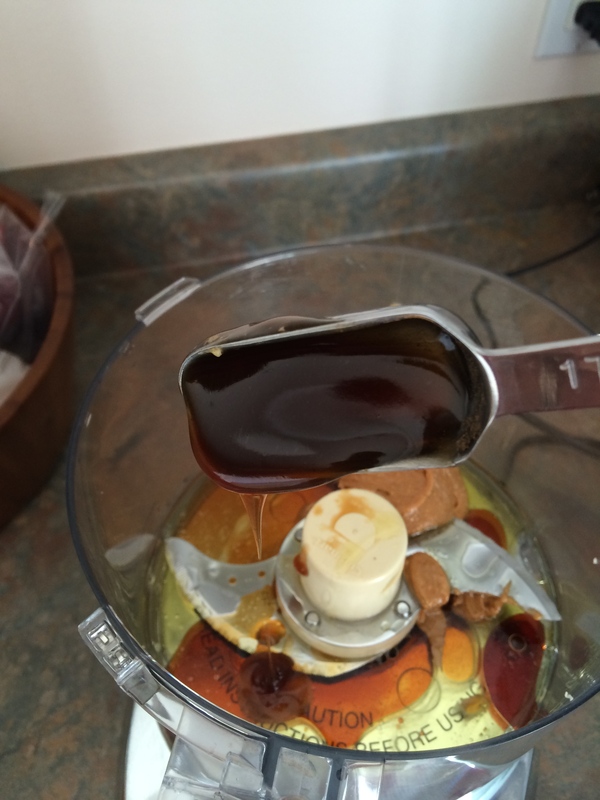 Add the dressing ingredients to a food processor and blend until well mixed (about 30 seconds). Alternatively, use a whisk to mix together. When ready to serve, combine the chicken to the salad. Add about 3 Tbsp of the dressing to the salad and toss together. More salad dressing may be added individually. Enjoy! Kara, this looks great. Question: how concerned are you about MSG in food? I’m assuming the Hoisin sauce has MSG (I could be wrong). It is hard to find stuff here in Mexico that doesn’t have MSG. I’m actually ashamed to say as I write this comment that I’m not even really sure what MSG does…I just hear it it isn’t healthy. Is that something I should worry about? Great questions! There’s actually no MSG in the hoisin sauce (although the first ingredient *is* sugar, which isn’t really the best thing either). I’m not overly concerned about MSG in my food, especially since I don’t have it all that often anyway. MSG is monosodium glutamate, a flavor enhancer for a lot of soups, Asian cuisine, and other savory dishes; in other words it seems to make foods taste better. :) Right now there’s no definite evidence that MSG is as bad as people make it out to be, although a small percentage of people do react to it with mild symptoms. All that to say, don’t go out looking for ways to get MSG, but it’s not the end of the world if eat some every now and then. Hope that helped clear things up!